There is nothing more carnivorously divine than the combination of beef and pork, especially when the combination includes bacon and steak. Bacon wrapped steaks can be found anywhere; from the menu at a 5-star dining establishment, to the backyard barbecue at your neighbor's house, the two ingredients are perfect complements of each other. Baking in your home oven takes very little preparation, and the dish cooks relatively quickly. What you dress your steak in is up to you, whether a classic Bearnaise sauce, a bottled steak sauce, or a vegetable relish. Preheat the oven to 400 degrees Fahrenheit. Meanwhile, heat a large skillet over medium heat with enough olive oil to coat the pan. Allow the oil to heat up before you add the beef. Place the beef in the pan and sprinkle with salt and pepper. 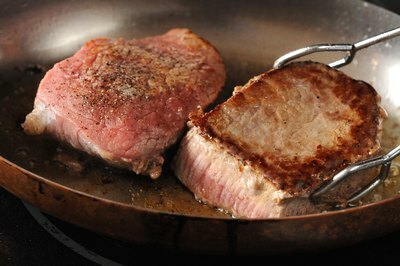 Cover the pan and allow it to sear for 2 to 3 minutes on each side, turning over each piece with tongs and not with a fork. 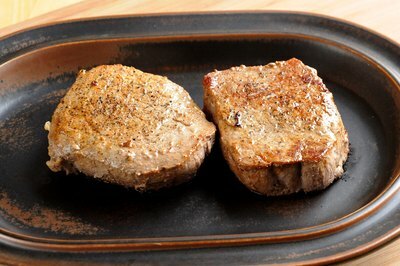 Remove the steaks from the pan and let them cool on a plate until you can comfortably handle them. Meanwhile, line a baking pan with foil and lightly grease with olive oil. Wrap each steak with one strip of bacon, wetting your fingers with water to attach the ends together. Do not poke holes in the steak with skewers or toothpicks, this will cause the juices to escape. Once the bacon begins to cook it will stay in place. 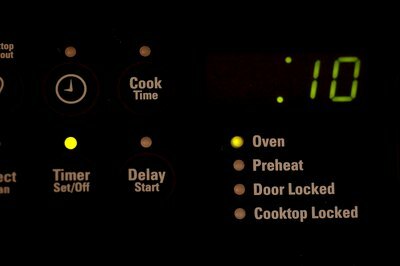 Bake until the steaks reach your preferred doneness; 10 minutes for medium-rare, 15 minutes for medium, and 20 minutes for well done. Prepare the sauce, relish, or cream while the steaks cook. 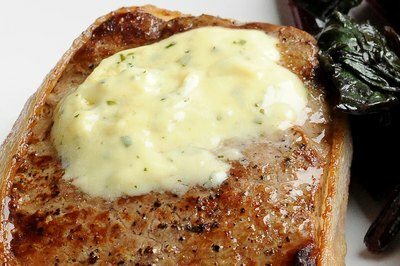 You could use any steak sauce or relish you like to top the steak, such as a classic Bearnaise sauce (recipe follows below). Allow the steaks to cool at least 5 minutes before dressing and cutting into. 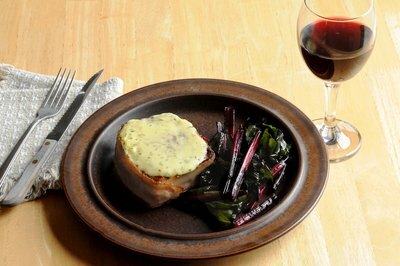 Place 2/3 cup white wine vinegar along with 1 minced shallot and 1½ tsp. dried tarragon in a small saucepan over medium heat. Bring to a boil and let remain untouched until most of the liquid evaporates (only 2 tbsp. remain). 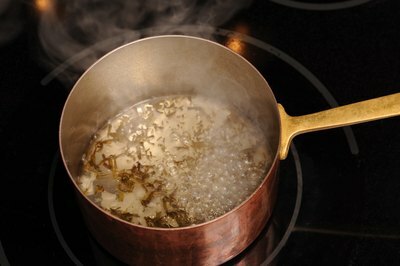 Strain over a small bowl, and return strained liquid to the pan. 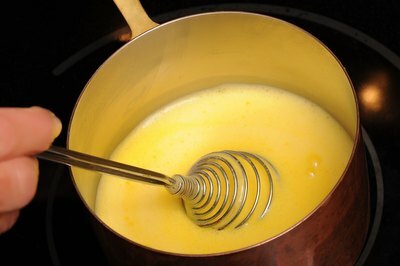 Whisk 4 egg yolks and 2 tbsp. water until creamy. Add the yolks to the pan with the reduced vinegar and cook over low heat while constantly stirring with the whisk (about 4 minutes) until the mixture thickens significantly. Add the butter (while whisking) in small increments until 1 whole stick is incorporated. 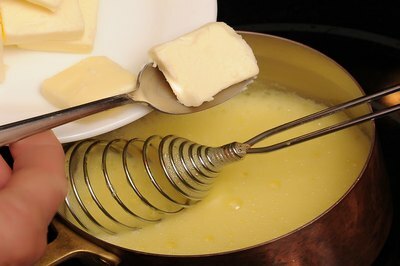 If your butter is unsalted, add a tsp. of salt. 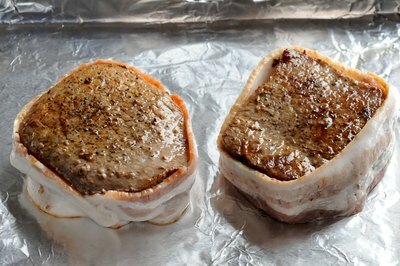 If it is salted, remove from the heat and ladle on top of your bacon wrapped steaks.